Andhra Pradesh goes for election in 175 assembly seats today and the results for the same will be declared on May 23rd. This is first election to the AP assembly after its bifurcation in 2014. The ruling TDP for the first in over three decades will be contesting elections without any alliance partner. 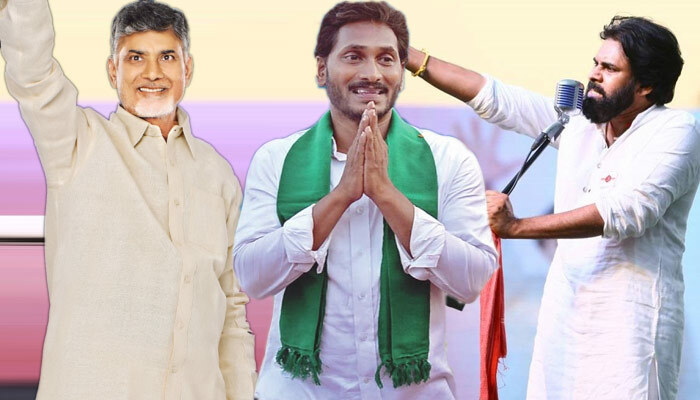 Almost all the constituencies in the state are witnessing multi-cornered contest with TDP, YSR Congress, Janasena, Congress and Bharatiya Janata Party fielding their candidates. However, the main battle will be between TDP, YSRCP and JSP. TDP chief and CM Chandra Babu Naidu will be seeking election from Kuppam, while his son Nara Lokesh is making his electoral debut from Mangalagiri. YSR Congress chief YS Jaganmohan Reddy is fighting from Pulivendula. JSP Chief Pawan Kalyan is contesting from two constituencies- Gajuwaka and Bhimavaram. AP Congress chief Raghuveera Reddy is contesting from Kalyandurg segment. CBN’s brother-in-law and senior hero Balakrishna is fighting from Hindupur. TDP is expected to struggle minus its former allies BJP and JSP of Pawan Kalyan, who helped TDP scrape through in 2014 polls with a wafer-thin majority. TDP won 102 out of 175 Assembly seats while YSRCP secured 66 seats, though voting difference between the two was a mere 0.4%. Strong anti-incumbency, caste and corruption are the foremost aspects that could conclude the result of the elections to the state assembly.